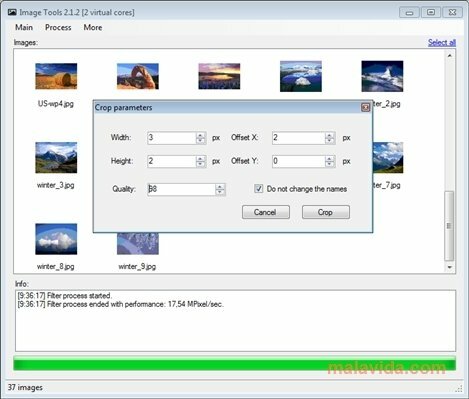 If we need to prepare a series of images to create an album or upload them to the Internet, and we need them all to keep the same appearance (size, format, brightness,...) and that also include a watermark, we'll need an application with which we can apply changes to a group of files at the same time, because doing the same process to each image with an editor can be tedious work. 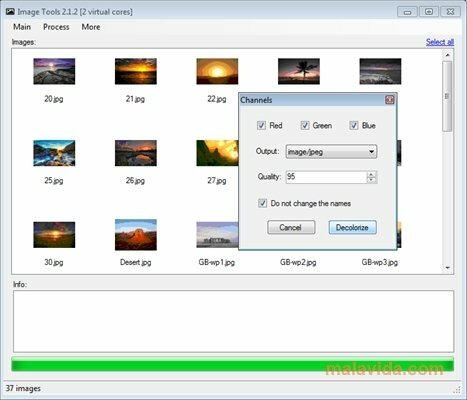 With Image Tools we'll be able to quickly edit and process multiple images at the same time (also individually), being able to change the size, crop or rotate each file, apply watermarks (with a text or other file), rename the files following a pattern or convert them to another format compatible with the application (TIFF, GIF, JPG, BMP and PNG). The application also allows the user to edit the contrast, tone and color of each image individually. Download Image Tools right now, an application that will help you process your photo collection.